As the population of the world moves into these mega-cities, some of which cross national borders (like the city of Basel/Basle itself), people become wealthier. But it is a slow process. The UN Report shows how poverty remains the norm in the rural areas, and it takes years for the City to absorb the peasants arriving, destitute, into its neighborhoods. The urbanization of the world population helps explain how internet access is growing so quickly - three billion people in "non-OECD" have gotten internet access at ten times the rate of growth of wealthy nations, because they don't have to run wires very far. Just as the USA lags in putting rural areas into high speed bandwidth, the rural farmers of the third world might not know what to do with a laptop if they got one. The recycling centers in the USA's own cities tend to be in areas with lower property values. That makes sense, recycling is a penny-per-pound bid buiness, and putting your recycling yard in Hollywood or Fifth Avenue of Manhattan just isn't very smart. So the recycling for these mega-cities winds up in places like Guiyu and Agbogbloshie. This helps explain why, when BAN goes to photograph recycling operations overseas, the 83% of the world population looks incredibly poor. But now BAN is exposed for lying about those areas importing directly. Cities like Guangzhou and Cairo are getting wealthier, and getting internet. They got affordable display devices from places like California (before SB20). Then these huge mega-cities upgraded and the used computers they bought ten years ago wind up in their junkyards, just as our junk winds up in our junk yards. Everyone is getting into the act. 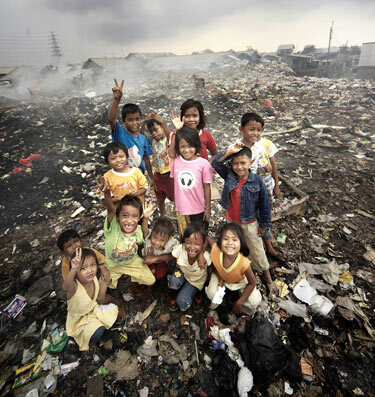 Look at this photo taken by Hong Kong photographer Chan Kwok Hung of children by a dump in Nepal. Who knows what is in the dump?? We are sad for them, very sad. But it has nothing to do with imports. And now we know, Guiyu and Agbogbloshie are recycling material which was used productively for years. Eliminating exports of "intact units" - the standard proposed by several large supporters of HR2284 - would stop the internet, and stop these mega-cities from their tremendous march towards wealth and development and democracy. It would not eliminate the dumps, and the pictures of the children will only get worse if they have less and less profitable scrap to dig for. The key word is "Responsible". If you don't trade with the fastest growing internet cities in the world, no watchdog will accuse you of exploiting them. Shredding a monitor into little pieces before it is exported is somehow superior to setting up fair trade recycling standards, and finding ways to work together with cities that will in ten years be more modern than Basel Switzerland. "This non-profit takes our picture, they use it to raise money in Seattle, then they license our photos to companies... who pay them for it. We not only don't get a cut, they actually use our pictures against us. They call us all kinds of mean names, like dirty, toxic, polluting, and my least favorite, 'primitive'. The parasites of the poor have a self-fulfilling prophesy. Unfortunately, their good intentions don't help. The self-declared "perfect" have made themselves the enemies of the good. Great post. I hope the CES Show goes well for you and Robin. This is brilliant. The anti-export storyline has been completely outclassed.